The adaptation sets the play in modern times, the actors wear modern, if largely old fashioned, clothes and words like television and hair transplant are used. But the setting is neither naturalistic nor poetic, and that world never comes alive. It’s a vague place for people who probably don’t exist whose suffering is not real. As a result, their conflicts seem small minded and inconsequential. The modern words make the text sound banal, which in turn makes Chekhov’s big ideas sound nonsensical. An elevated stage dominates the set and, if you look carefully, you can see it is made of numerous ordinary tables, the one next to the other. The stage space is huge and actors in the same scene are often at opposite sides. The space between them is vast, the psychological isolation is rubbed in our face and the actors struggle to make connections (with the play, the other actors, the audience). The directorial ideas are intrusive and don’t trust the text: Mariah Gale as Olga and Gala Gordon as Irina use bedclothes to create two little tents and play the scene from inside the tents, invisible to the audience. Irina, at the end of the first half, climbs a pyramid of tables and screams her suffering as the lights go out for the interval. The house lights need to go back up for the poor actress to climb down (otherwise she might break her neck), and as theatrical illusions go, the result feels clumsy. Individual elements are interesting: Mariah Gale in a bear costume talking about how life had exhausted her, a soldier playing with a toy remote control helicopter, the backdrop framing the actors beautifully. But these things struggle in isolation in a production that is vague, loud (not in a good way) and far far too long. 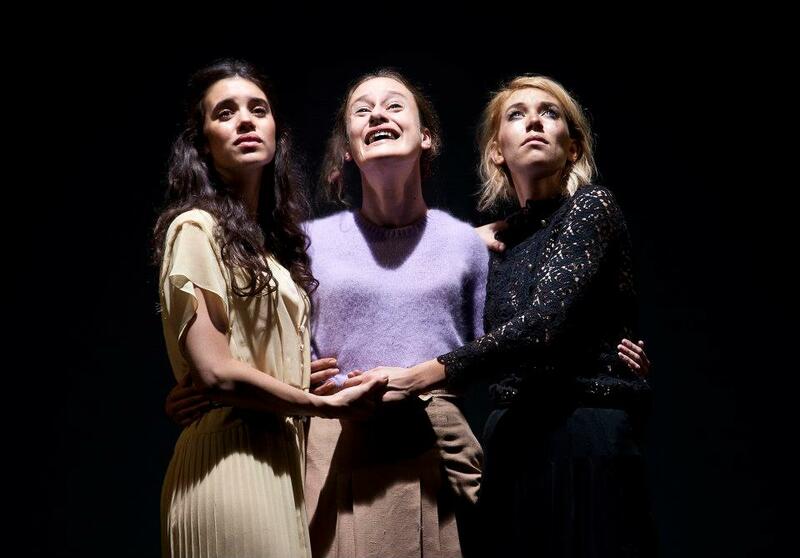 The actors (among others Mariah Gale and Sam Troughton reunited after RSC’s Romeo and Juliet, Vanessa Kirby so good in The Acid Test, and Gala Gordon making her professional debut) are universally good, but for all their talent and effort, they couldn’t make me care. In the interest of full disclosure, in my party of four, two of us hated the production, one loved it, one loved some of it but not everything. So it’s possible I am missing something. But nothing will convince me to go back to find out. For a different take, read Revstan’s review. This entry was posted in Reviews and tagged Benedict Andrews, Mariah Gale, Sam Troughton, Vanessa Kirby, Young Vic. Bookmark the permalink. Oh goody, I like one which divides opinion.